Life does get in the way sometimes. 🙂 I intended to post this well-clamored for recipe last week but alas my migraine headache for 3 days in a row totally prevented me from doing so. So, I apologize to those who were normally awaiting another recipe last week. Things were certainly beyond my control. I guess, it’s better late than never. Anyway, let me assure you dear readers that this recipe is certainly worth the wait! As some of you may know, Adobo is the national dish of the Philippines. It is very popular not only because it truly is tasty but because of ease of preparation and the fact that, at least by Filipino practice, it does not require refrigeration. The vinegar acts as a preservative and not just a flavor enhancer. This was important during the olden days when refrigeration was virtually unknown. Hence, the adobo cooking technique which uses vinegar is very popular in our country and is used in many other indigenous dishes. To make it even easier, I have decided to finally try a slow cooker version for Chicken adobo, after all it already requires some braising time and the crock pot is the perfect vehicle for this dish. Some, like hubby, prefers the classic savory taste of adobo. I, on the other hand, prefer a slightly sweeter version. I have provided an option for either version so you can choose. The oyster sauce is also optional so you can leave it out if you are allergic to it or simply does not fancy it. It’s tasty either way. One thing you shouldn’t forget is the rice which is the perfect side dish for this, naturally. And, I suggest to make this ahead of time (a day before) to allow the chicken to fully absorb the flavors. Enjoy! To remove photos for printing, simply click on each image to delete them. Chicken slowly braised in vinegar, soy sauce, garlic and bay leaves until fall-off-the-bone tender and DELICIOUS. It tastes even better the next day if there are left-overs! Heat the oil in a large frying pan over medium heat. Brown all the chicken pieces in batches. This step is highly suggested but if you are in a hurry, this may be omitted. Alternatively, you can use skinless chicken pieces to avoid the browning process. Mix together in a bowl the vinegar, soy sauce and water. Place the browned chicken pieces in the slow cooker. Pour the vinegar mixture all over the chicken. Evenly distribute the garlic, peppercorns and bay leaves. If you don’t fancy picking out the peppercorns on your plate, feel free to replace with freshly ground pepper but adjust the amount to your taste preference (a teaspoon to begin with). Cook on low for 4-6 hours or until chicken is tender. NOTE: If you want a slightly sweeter adobo, add the sugar to the vinegar mixture or towards the end you can also sprinkle the sugar all over and gently stir it in. Serve with freshly cooked rice. Can be made a day or 2 ahead. Total time: 4 hrs. 20 mins. What a fabulous recipe! Can't wait to make it! I Love slow cooker meals. I can't wait to get my hands on that adobo sauce and get started! The chicken just looks so appetizing! I love adobo chillies, and they really don't get highlighted enough, so yay for this recipe. 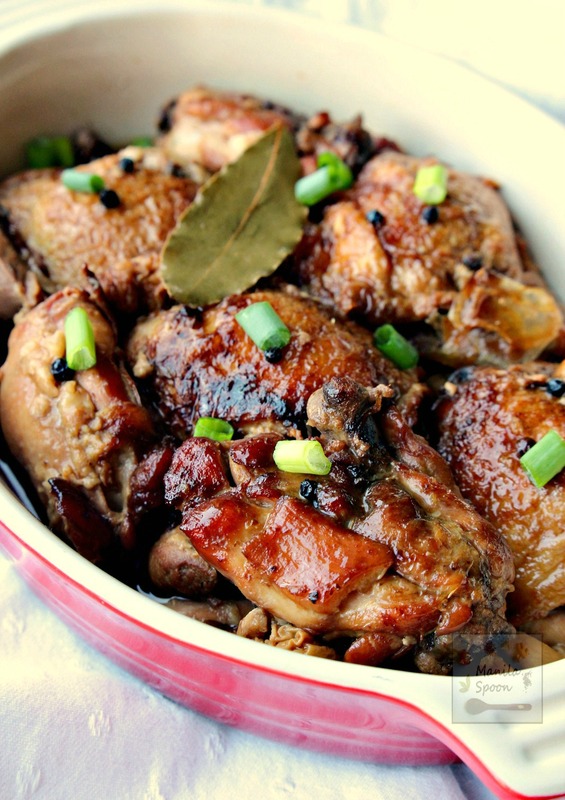 Chicken Adobo looks so flavour packed! Yum! Sorry to hear about your migraine, Abby. My sister-in-law gets those often and it's so so hard. What a beautiful dish this is and I am headed to the grocery store soon and getting the ingredients. With track season in full swing for my older boys now, I really rely on slow cooker dishes to get a quick meal on the table at night. Can't wait to try it. I get the visual part of the migraine, so I understand some of what you're going through. They are awful. This slow cooker dish is great for days where you don't want to cook. It's sure to be a family favorite! The headaches are awful! My mom used to have them pretty often! This chicken is right up my alley! Abby, I have actually never made Chicken Adobo and am excited to try your recipe. I just love the ease of preparation! I am sorry to hear about your migraine and hope you are feeling better! My slow cooker has been ignored since out move. Time to take it out and make it happy! Absolutely mouthwatering! My mouth is watering looking at your pictures! Gosh this recipe sounds amazing! The flavors in this recipe sound amazing!! Pinning so I can try it ASAP! Thanks for posting. 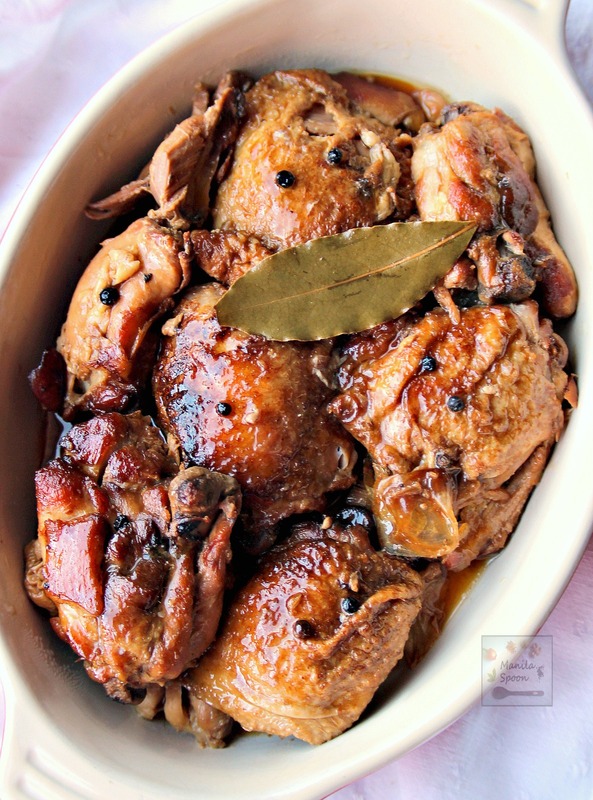 I have always done the tradition adobo recipe on the frying pan like my mother-in-law does, but I will have to try this since us moms don't have a lot of time to cook in the evenings. I hope you are feeling better. Hope you all enjoyed it! This is how my hubby likes his adobo. Thanks for trying! Does the chicken skin stay crispy? Hi Karen! We were on holiday so haven't caught up on the blog until today. No, the chicken would be cooking for a few hours in the slow cooker so the skin won't be crispy as it would have been soaking for quite a bit. If you want crispier skin – simply fry the chicken after it's been cooked. People either fry it before or after, adobo has many variations and each family have their own style of cooking it. Thanks! So attractive! So nice to enjoy it. 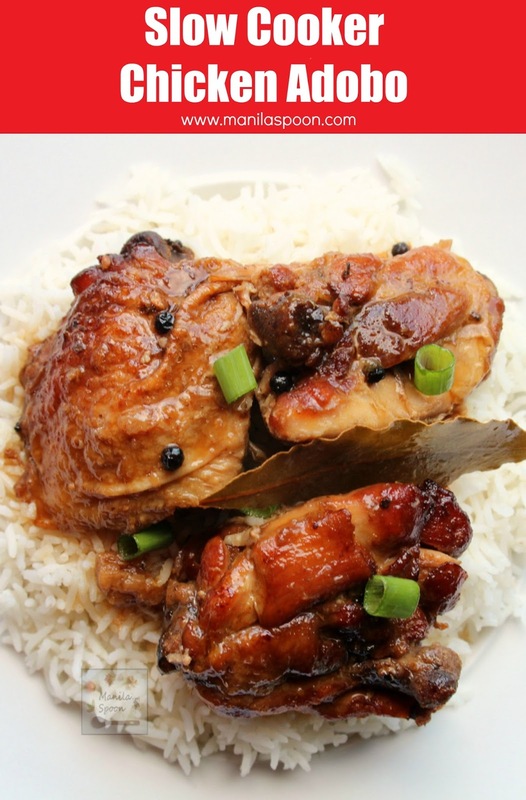 i've only had chicken adobo with coconut milk, but i can't wait to try this version! i'm interested in how this kind is, since i feel like this is the more popular one (from what i can tell, at least). Love using the slow cooker in the summer. Thanks for this! I made a crock pot of this dish and a potful of your Classic Chicken Adobo recipe at the same time (I had too much chicken for my crock pot). I combined them next day in crock pot and reheated on low for an hour. Served with plain basmati rice and combination of broccoli and suey choy that I stir fried in a bit of chicken broth with a few drops of sesame oil. It was a hit – all seven of us had a second helping. Thank you for such great, easy, delicious recipes. This recipe is so, so delicious and (per your suggestion to save the sauce) the next day I made an excellent fried rice utilizing leftover sauce, chicken, and rice. This is a recipe I will definitely make again. Superb! Thanks, Wendy! I am so delighted you enjoyed it. It has become such a hit. had a 'practice' run with friends before making for a friend visitng from Manila… I was sooooo worried but it was a definite hit.. they even sked for the recipe! Oh great!! I'll make it for lunch tomorrow! Thank you so much Manila! Can I brown the chicken the night before, pile ingredients in the crockpot and then cook the next morning? To be honest, I am entirely unsure about this as I haven't done it this way. Not sure about the health risks involved as well of partially cooking chicken and then leaving it overnight because of salmonella, etc. Some have done so and we're fine with it but that's for chicken baked in the oven where an immediate hot temp is present whereas in a slow cooker – it takes longer to achieve the right temperature to heat up the chicken and kill any remaining bacteria. If you wish, simply just marinate it overnight and cook it the next day. Some Filipinos fry the chicken after it's been fully cooked so you can try that, too. I'm making this tonight and omg my house smells so yummy! We're excited! Brooke Crooks, place the fried chicken in fridge then place in slow cooker when ready. What's really needed here is the color. we love your recipe, thank you so much!!!! Thanks and glad to know that! Thank you for this awesome recipe, this is my family new favorite! So glad to know this Forrest! Appreciate you giving us a feedback! So glad to find this as I want to cook overnight for Easter lunch tomorrow. Is it best to just keep warm in slow cooker till party time or is there a better way to heat up? This was great – thanks! I didn’t fry the chicken first, as I used boneless and skinless chicken thighs. In the last hour, I added courgette on top, in thin slices, to have some veggies with this. 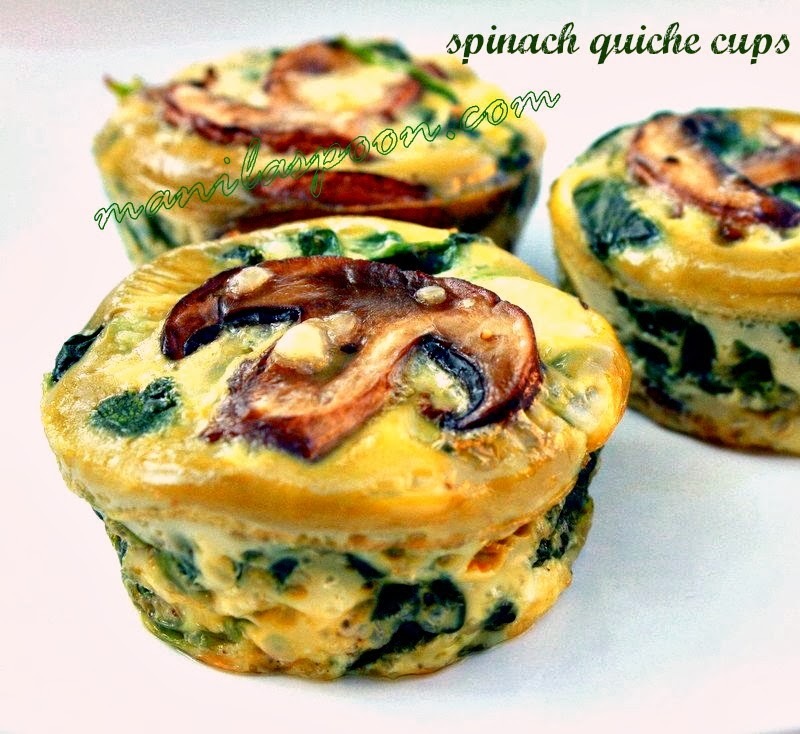 In the past I have added leafy greens in slices and this was delicious too! Thanks so much! I love that you added courgettes. I have to try that next time. Thanks for letting us know!! Glad you enjoyed this! I’ve been making adobo for years and it’s still one of our families favorite dishes. We use the wing sections and make a big 8-10lb pot of it and serve it over rice. I love that you’ve included the simple recipe as I see others try to make it and they add or omit too much! I actually plan on making this tonight and since I don’t have a kitchen yet due to a renovation I’ll be using my slow cooker. Question, have you tried doing this in an instant pot? Thanks!! Yes, if you go to the search box on the right side bar under my photo – you can key in instant pot adobo, if you prefer to make it with that. Thanks! Hi Abby, I’ve actually made adobo many times and I love it. I’m wondering how long you’d have the crock pot on while reheating? And would you have it on low or high? I’m afraid of overcooking the chicken while reheating. Thanks for the help! I’ve read that it’s not advisable to use the slow cooker for reheating because it takes so long for the food to reach the proper temperature which makes it a bit risky health-wise so I don’t really use it for reheating. I would either microwave or reheat on the stove top on a low setting (so it doesn’t dry up) until it’s fully heated through. If you still wish to use the slow cooker, length depends on how much you are reheating and how fast your slow cooker is. Apple cider is a bit too strong but you can offset it with some sugar but if you’re able to get it rice vinegar which is readily available should be a good substitute. What am I missing? Isn’t Adobo jalepeno peppers in a spicy sauce?? Or is it just a name in this recipe? No. It’s the Philippine’s national dish and it’s made of chicken or pork. We were also colonized by Spain for about 400 years hence the name Adobo which in Spanish simply means – a marinade or the immersion of food in a stock for flavor – which in this case is Asian stock with soy sauce and vinegar. Hope you try it. Will chicken breast be okay to use? Thanks! Yes, you can.Just simply adjust the time of cooking. In the Philippines, we use all parts both dark and white meat chopped in bite size pieces. I tend to use to use the dark meat because they absorb more flavor and very good for slow cooking but that doesn’t mean you can’t use breasts, too. 🙂 Enjoy. Hello thank you for a slow cooker version of this delicious chicken recipe. I didn’t see the adding of oyster sauce to this like for the instant pot version, do I need to add for slow cooker or just omit? Thank you. It looks so delicious. 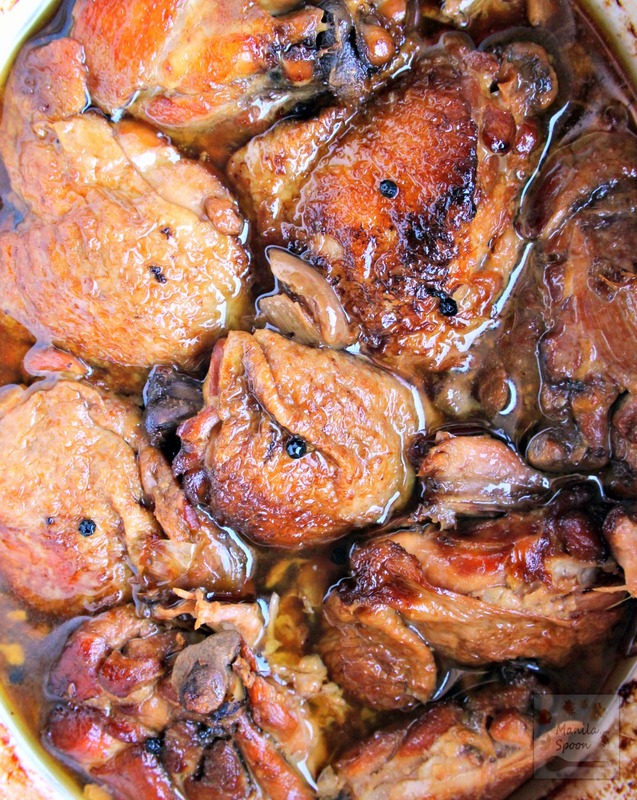 Slow Cooker Chicken Adobo is really a great idea, the topping is also very good. I shall try this delicious dish by my self. Thanks a lot for this wonderful share. I just made this using chicken breast since that’s what I had. We did the sweeter version. It is amazing! So glad you enjoyed this! Thank you for letting us know.